The police force across this country is losing it! We are seeing endless stories of police brutality and downright insanity as the police are becoming more and more militarized. A sergeant in Forsyth County, GA was arrested earlier this year after pulling a gun on a teen at a McDonald’s Drive-Thru. It seems the cop got very impatient that he was waiting so long in line, so he got out of his car and yelled at the high school teen who was waiting on his food ahead of him. The cop has been arrested for aggravated assault. 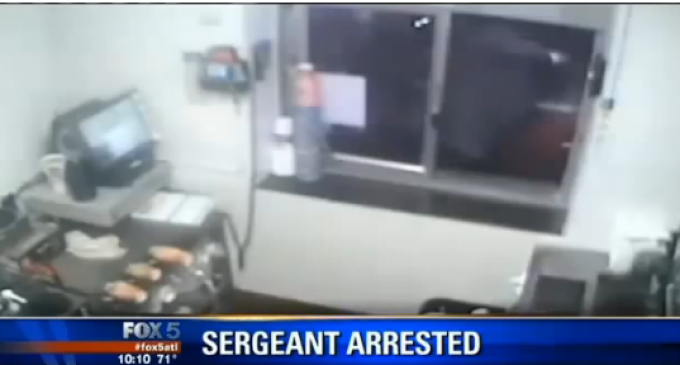 FORSYTH COUNTY, GA – Surveillance footage revealed a police officer pulling a gun on a teenager who was innocently waiting for his food at a McDonald’s drive-thru window. Ryan Mash thought he was going to be killed when a police officer approached him with his gun pointed at his face. Police Sergeant Scott Biumi of the DeKalb County Police Department was arrested when the video emerged and the officer was charged with felony aggravated assault. Fire him DeKalb. Bad apple. Well just maybe when he applies for a job there. He will be tuned down. Yeh. Who polices the police? The P. D. protect US from bad apples, and WE the CITIZENS need to protect the good cops from their bad apples…..